So, finally I decided rather soon that I had to go back to the bear and his town. When I was there in April; I knew in advance already that September was way tooo far away. Well, good for me, there were a lot of Knutians coming in June and there was a room available in my hotel . And so, on the very early morning of June 4, I kissed my cats "Auf Wiedersehen" or something like that in German, closed my front door and left for the Town of the Bear. In the beginning when my brain and my thoughts were at least 900 Km away from Leuven and that I wanted to see the young bear, I never paid so much attention to the landscape and the views, but this time I did it and it was worth it and not only for the German part, but also for the Belgian part. 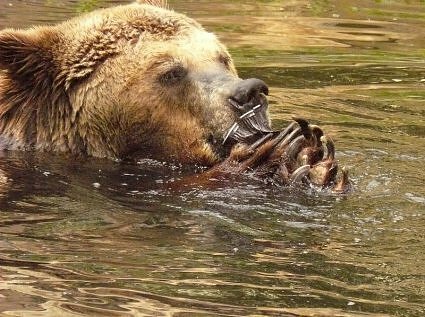 When I finally arrived in the Town of the Bear, I went straight to my hotel for check-in and then to the Zoo for the renewal of my annual ticket. Funny detail, you may then go via a door which makes you enter the Zoo immediately. I like this detail because it is actually rather close to the elephants and this time, of course, I wanted to see Ko Raya as soon as possible. Well, it goes without saying that she is adorable although my favourite is Shaina Pali. Of course, Ko Raya is sweet and of course the elder ladies and the gentleman are impressing, but sweet Shaina is on top of them all. Not only she is still young enough to be seen as a baby, not only looking adorable AND PRETTY (because according to me, she is definitely a beautiful girlie) but most of all … this time she also showed the more mature part of her (which part will grow day by day and this not only for her sissie, Ko Raya, but in general). And a view that even made this eternally ‘kwebbeling" woman very silent, is the combined and therefore majestic power of the ladies to protect and defend the little baby. 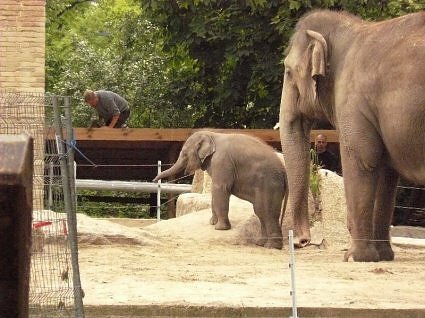 There were also works being done around their enclosure and I must say that Ko Raya did not suffer of the noise or so. To the contrary, I had the feeling that she was checking whether everything was under control (with the help of mommie of course). And it also occurred that at a certain moment I wanted to make a pic of the elephants and then I noticed that one of the work men waited til I was finished. So I thanked him for that kindness. 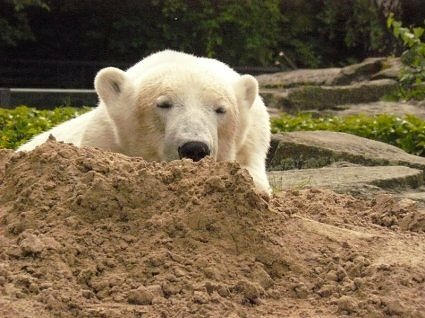 And then, I went to Knut.. And this young bear is simply what he has always been: his own gorgeous, playful, healthy self. Had to make my own tours because by now almost everybody knows that I cannot stand/sit/stay still for longer than 30 minutes. Unfortunately, I am not good to bring a report from minute to minute or day to day. It is more a copy of my impressions and so is this report and so are my pics. So, at a certain moment, I was wandering around again and saw the two young hippo’s (girls ???) in a very funny playing/fighting mood. And up and down it went with a lot of water splashes till the moment they realized that there was an audience for this and then you could see them both looking as "Atsch, they have seen us". And Dear All, one thing is for sure, one of the most wonderful and also most wild things one can see in his life, is DEVI. Good my, when she is sitting in one corner and one is focusing to make a photo, you may lay a bet that on it that at that same moment she is already in the other corner of the enclosure. It is so difficulty to make a decent pic of her, not only because she is black and that there is always too much shadow, but especially because she cannot sit still (unless she is drinking of course, but that is always on such a spot that one barely sees a thing). In the end, I gave it up and started to watch her and her "capriolen" and even then, you realize that two eyes are not enough. One of my other visitors was the miniminimini nilli. Since the weather was actually during these days not so wonderfull, the little one was inside with Debbie. My my my, a copy of the other "Spekrolleken" (like Paul of last year). Sometimes, it (I do not know whether it is a he or a she and therefore prefer ‘it’) is hiding behind mommie Debby, and on other moments it is very active. So, it happened that when I arrived there both were under the water playing and a part of the game was to jump and get up with the head out of the water. It was soo funny but also soo fast that is was difficult to take a decent pic of it (believe me, at such moments, you regret that photo aunties are not around the corner). Na ja, I tried it. But the result was niks nul komma niks. 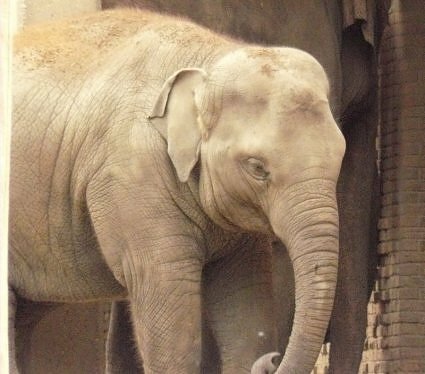 Little anecdote, on the morning of Knuti’s 30 month-birthday, Bea and I entered the zoo and were on our way to Knutje. When we arrived at the Hippo’s Avenue, we met a small group formed by, for example, Messrs. Klos, Ochs and Schüle. Since we are both very friendly ‘young girls’, we both nodded our head by way of ‘Good Morning’ but the only one who reacted was …; of course, the young Dr. A. Schüle. And from the rest, a sour face. Na ja, that is their problem, not mine. 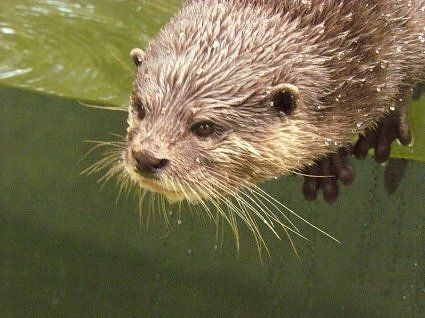 And this time, I was also very lucky to see the otters and I hereby take the opportunity to say ‘Thank you Simone and Gudrun for the pics and the videos, you both know how much I like them’. It is very funny, but I noticed that when there a lot of people standing in front of an enclosure, it means that the "residents" of the enclosure are rather very active. And it is the more obvious when you arrive at the otters. When they are not out, then in all honesty, there is nothing to see, but if they are out, then there is plenty of fun. And I adore especially their little faces, showing a bit of the impression "and they are big and I am small". During one of my walks, I saw a little fox and a squirrel. Especially, the squirrel was not too shy. Of course, one cannot touch it, but it was quite possible to take pics of it. And it took the bread that was given by a young woman. Very friendly person by the way, because when she saw that I wanted to try to make a photo without being obliged to come too near (and then running the risk that the little "reddie" would get scared), she made two steps aside to give me a better view. 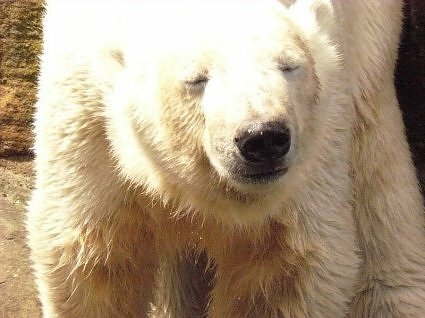 Also needless to say that when we discovered that Katjuschka was back with the other polar bears, we were all relieved. During one of my many walks I went back to the Ape house and for the first time, I saw the male orang utan. 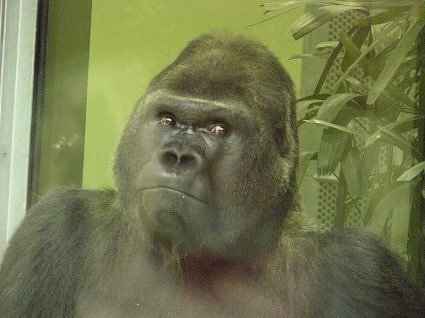 First he was standing in the middle of the cage with his back turned to the visitors, but then all of a sudden, he changed his mind and came very close to the glass shield and started to watch us. I was impressed by his size, but most of all by the elegance of his movements. However, the two things that made me very sad was, first of all, the noise (well, I must admit that I have no idea of how much he can heard this through the glass, but nevertheless, it did not give me a comfortable feeling), but most of all, the flash lights. I could have cursed when I saw these flashes straight in his face and reflected in his eyes. Then I wondered whether and why people do not realize that this is not pleasant. Well, I must say, he kept on being very stoic. And then, also for the first time, I saw the gorillas and more particularly, Ivo. One thing is for sure; I never will start a discussion with this guy. But, he is keeping an eye on the people and I was not having the feeling that he appreciated our kind that much. 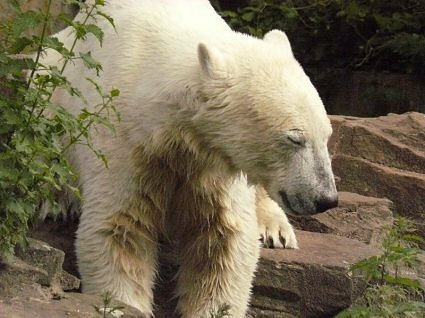 And watching Knut is always a lovely pastime, whatever he is doing or not doing. When I was there, his aussie-dog was still alive. So, from now on, I am saying a little prayer to make sure that he can finally destroy it before the guarantee period is terminated. 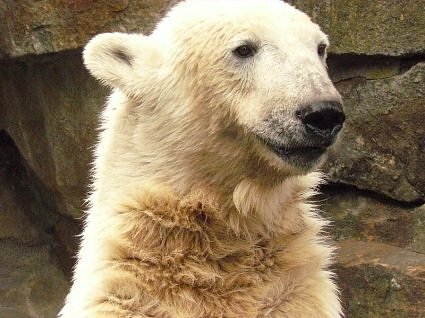 On the website of the aussie-dog toys, they mentioned that these toys were made in close collaboration with Inuka, the polar bear who can destroy almost everything. 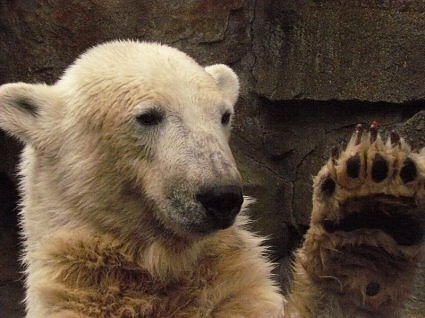 Hello Inuka, come to the Town of the Bear and meet your compeer. 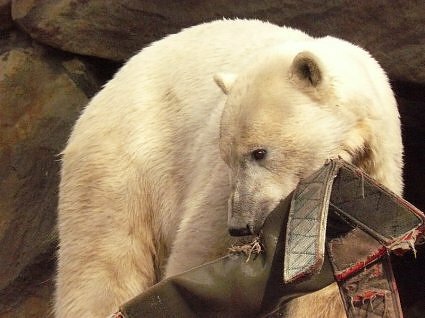 What also always forms a great moment is the feeding of Knut by Sylvia Weckert. She is making a real event of it and it is obvious to all of us, this woman loves the young bear. It is such a lovely interaction between the two. According to me, having Mrs. Weckert as a keeper was one of the best things that could happen to Knut after the passing away of Thomas Dörflein. Please do not get me wrong, I am certainly not judging or blaming or whatever the other keepers (Messrs. Henkel and Robke), not at all, let that be clear. Except that she is forming a terrific add to Knut and her colleagues. But when she is doing the feeding, I always try to make photo’s and to watch as much as possible. Result; I see only half or parts f the feeding and my pics are simply worth nothing. And from now on, I have sworn, next time, I will only watch and let the photo aunties do the heavy job (hihihihi, Simone, Christina, Marion, Gudrun, BITTE, be prepared). And by now, you all have heard of Mammy Kwack and her six little kwackies. Yes indeed, I am talking about the duckies. Well, well, this Mammy Kwack deserves all our respect. I watched her while keeping an eye on her babies, cleaning her feathers and chasing a cheeky crow away. Na, one thing is for sure, the crow was certainly not having the guts to come too close. But let me tell you what happened on Saturday, shortly before I had to leave the Town of the Bear to come back to the Town of the Cats. 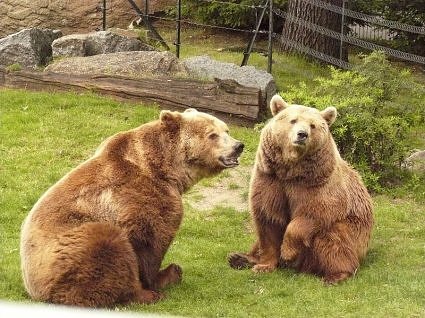 As usual, I was walking around and while arriving at the brown bear enclosure, I met another photo auntie. So, we started to talk and to exchange little ‘ditjes en datjes". And then we realized that the brownie playing in the water with a "stoksken" was actually our dear good old Bernie-boy. But then, oh my oh my oh my. Mammy Kwack and the little kwackies were stucked between two brownies; Pezzi (hope that this is the correct spelling of her name) on the one side and Bernie on the other. Needless to say that there was a certain Kwack panic. But … Mammy Kwack kept the head cool and started to calculate the situation and position. Luckily for her, after a few seconds, Pezzi was getting out of the water and then immediately chased by Siddi (that’s is a real "Mottig Portret" as we say in Dutch, unbelievable how aggressive she is). So, this offered Mammy Kwack the opportunity to let 4 of the little kwackies escape to safer places. Two were still left with her when Bernie started – while making lots of SNURTSCH and SCHNARTCHS and SNORTS and PUFPUF noises – chasing them. But Mammy Kwack started to make false manoeuvres and we all know how fast Bernie-boy is. So after a while, they all could escape around the corner. OK, fine for Bernie who continued playing but every now and then he remembered the "Canard à l’orange" recipe. And ….. started to swim around the corner where Mammy Kwack and the little kwackies came back to see whether there was a possibility to reach their small meadow for a sleep in the sun. But ….. WAAAAAHHH, there was Bernie, quick quick back around the corner. 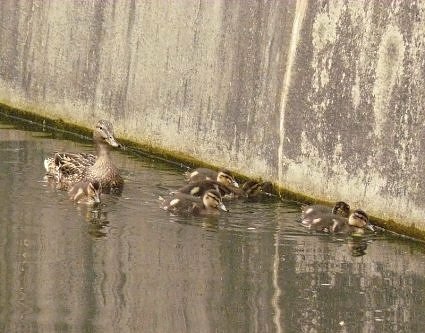 When I saw them all swimming in his direction, I started by yelling the warnings in English, in Dutch, even in German, but since none of these languages was really helping, I finally spoke Kwackish (and Nene is my witness) and OEF Mammy Kwack took the message. This was repeated for a few times without a win-win result. So, Mammy Kwack developed the ultimate security strategy. While Bernie was swimming with his "stoksken" in his mouth and thus turned his back to her, she gathered all the little kwackies and very silently, but VERY FAST, they swam next to Bernie to their safe haven !!! Believe me, while I was watching this, the nerves ran through my throat. As I already wrote in the beginning, there were a lot of Knutians there. And here is an anecdote. Together with one of them, I started to walk around and at a certain moment, I asked whether she was in the mood to say "Hello" to Krümel and Felix. It was OK and so we went, and we entered the "Fasanerie" to visit lots of the other birds. And there again I realized how few I have seen so far. I always discovered new things. But most of all, I was very fortunate that day because – finally – there he was again the "Argusfasane". It was more than a year since I last saw him (OK, I got a glimpse of him in April) and this time I could admire him in all his "grandeur" and beauty. There was a young girl making a drawing of him and this made us decide to turn back on our footsteps, otherwise he might have gone away. And do you know what made this "Birds Visit" so special??? Well, later in the evening, it turned out that the poor Knutian was actually scared of birds, but to do me a pleasure, she did not mention this. Another anecdote related to the Knutians. It is so funny and at the same time seen by all of us (the Knutians thus) as being perfectly well normal to make tours around the zoo, and one is starting the tour in the good company of another Knutian. But nobody knows with who of us he/she will end the tour. It often happened to me that I started to walk around, found somebody of us who asked, "hey, do you come with to Devi?" Fine, and then when you are there after a while somebody else is saying "I am going to pay the nilli’s a visit, who is coming with". Or "Somebody in a Ko Raya mood? ", "somebody wants to see the new veal" or "I need coffee". 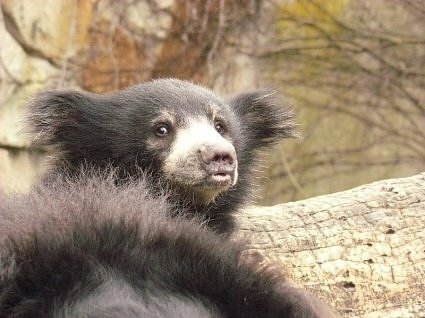 Or in the event that you have been walking around on your own and need some human company, it is always very easy: simply go to Knuti’s enclosure and you will always find some one of us to talk to or simply to sit next to and watch the young bear, whether playing or sleeping. On the same day of Knuti’s monthly birthday, one of the Knutians was also celebrating her birthday. Oh myyyy, we were lucky people and spoiled people. While drinking our coffee, she offered us lots of cookies, chocolates and so forth. This is one of the things with respect to the Knut Community that I enjoyed the most and made life worth it: even if it is for the very first time that you meet other Knutians, even if you are not from Berlin or Germany but like me from Belgium … you are immediately accepted and welcome. And language has never been an obstacle and always brought a smile on my face. Most of them start by saying, sorry but my English is very bad. When I then reply that they can speak German (but please not too fast), they continue in English for the rest of the time. And if you do not believe me, then ask Rosemary and Shane. We were all impressed by their English and one thing we know for sure "luckily nobody expected us to speak in German". Because that would have resulted in worse than Babbelfish. And you know what, Dear All, while writing these words, all the memories came back and made me wish to be back in the Town of the Bear. It was such a good time. Therefore, I hope to meet you all again in September. Be embraced and you are all in my thoughts.